Opinion: Worth it within a 3-4 hour drive. 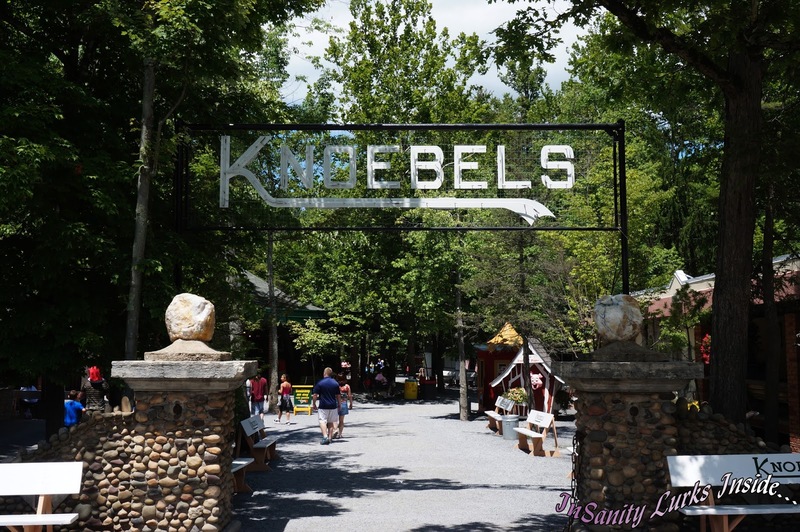 Overview: Knoebels is a small, family owned amusement park set in the mountains of Central Pennsylvania. It's not the most widely known park and tends to be frequented by folks from the area or those who know about this hidden little gem. 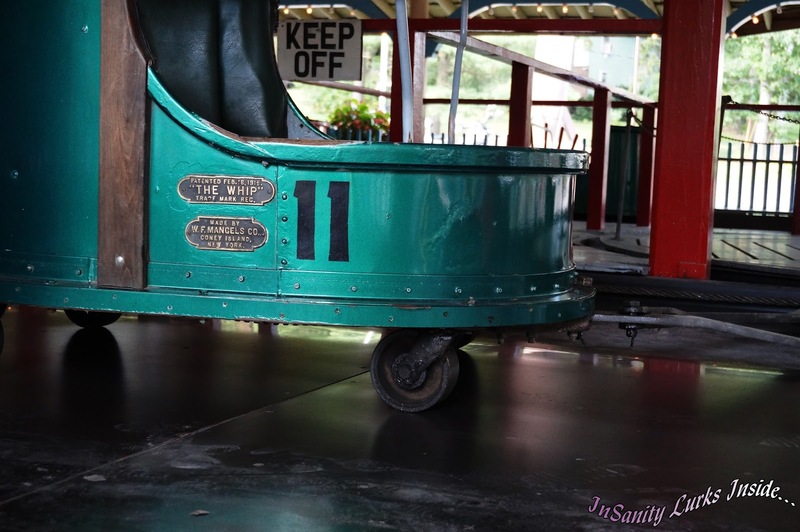 While not known for building their own rides, Knobels has a rich history of taking other folks 'unwanted/old' rides and moving them into the park, giving them a new life for folks to enjoy. The park boasts three relocated roller coasters, a classic 'pretzel car' haunted house and carousel that still has it's brass ring. The parks biggest claim to fame (and also their current embarrassment) is that they are attempting to build a wooden bobsled coaster, which hasn't been done since the 1920's. They've won the Golden Ticket award in 2012 for 'Best Carousel' and in 2011 for 'Best Food' and 'Best Carousel'. Now, I do have a minor complaint to vent before we get started here. Originally I had called Knoebels for media tickets which sometimes I get and sometimes I don't, it's not much of a big deal as once we have our plans for a trip we budget for tickets anyway. However, what burned my buttons is whomever I talked to made a dig that "Bloggers aren't media" which just made me blink. Most people who even report on parks these days ARE bloggers, not television or print media. So this is some seriously old fashioned thinking which baffled me. 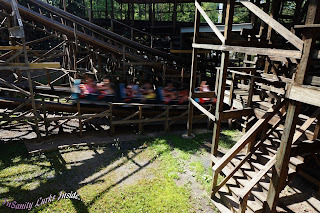 We headed to Knoebels in the early afternoon as we slept through our 'entirely too damn early' alarms and opted for a few more hours of sleep. This was worth it as the night had been oddly cold and allowed the weather to warm up to something near 'perfect' for the park. It was 'Craft Fair' while we where there which lead to very crowded parking lot conditions but we where pleased to see the lines didn't much reflect the cramped conditions. We found the park busy but not wall-to-wall with people. To understand the feel of the park we jokingly call it "A carnival that set down roots and never left". Some of their rides are straight out of your local fairgrounds while others are the beloved, vintage rides of other parks who discarded them for 'newer' attractions. It's a crazy mish-mash that you can't help but love. Unlike other parks, Knoebels still offers a ticket system as well as a 'ride all day' band. 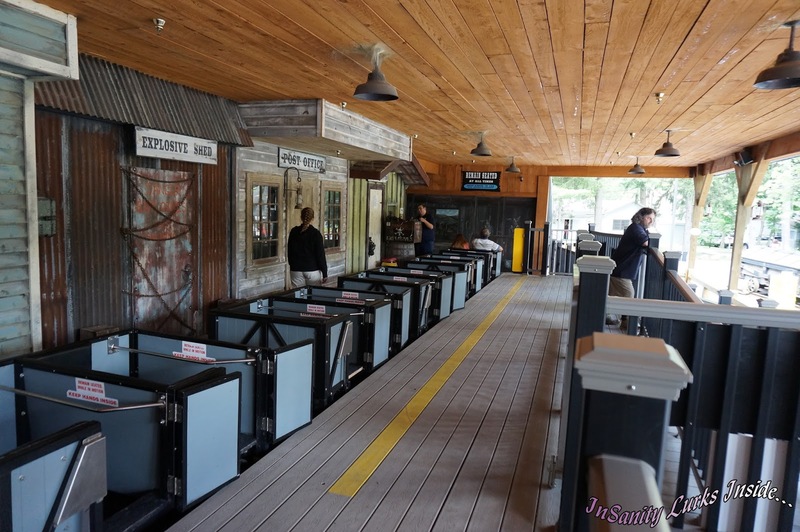 However, we opted for the ticket system as two of the main rides we wanted aren't offered on the ride band system (Black Diamond and Haunted House). We found our tickets at Weis Grocery Stores for $16 per book which is a $4 per book savings. Naturally we purchased 3 books and used up damn near all of them on the classic attractions offered at the park. Now, considering we skipped eating in favor of getting to the park our first stop was food. A quick check of our park map, we pointed ourselves in the general direction we wanted and stumbled into food along the way. 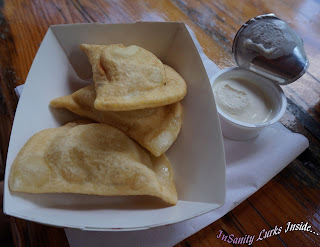 Finding a Pennsylvania favorite on the menu, we both ordered Chedder and Potato Perogies with Sour Cream, a White Burch Beer Soda for the huge whopping total of about $9. They where good! Made the right way and then fried to perfection, the soda is a Central PA favorite and an addiction so it was also excellent. Seating was easy to find and all of the picnic tables near the food stand offered a huge amount of shade and excellent people-watching for our meal. It's easy to see why they won the Golden Ticket in 2011 for best food, the prices won't break the bank, you get enough and it's GOOD. Tummy's full we bee-lined straight for our personal favorite attraction at Knobels, their classic dark ride, The Haunted House. 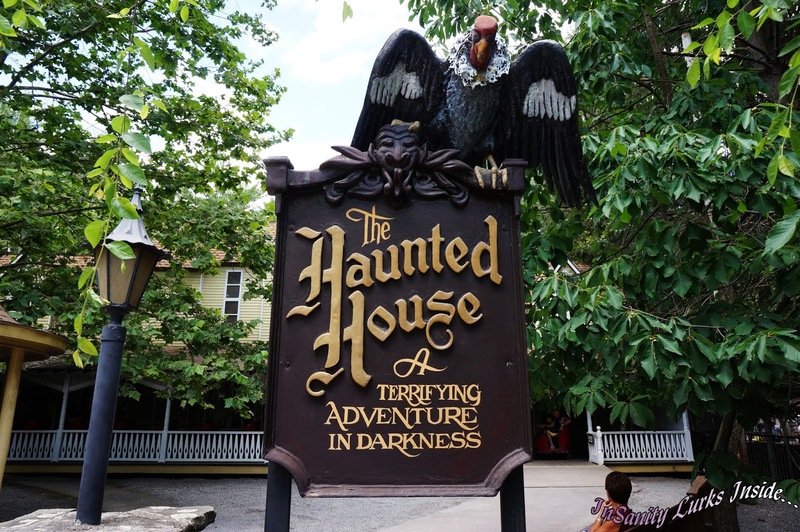 It's not considered the BEST classic darkride in the country for nothing, not only is it one of a few still operating with it's original theme intact but it's the pure cheese we all know and love. Opened in 1973 it uses classic props from other closed darkrides around the state as well as crazy creations built by the park themselves. It's a mish-mash of crazy, silly fun. Not all of it makes sense but in a classic haunted house, it doesn't have to. They kept that up and even if it isn't 'spooky' by today's standards it's hard to overlook something that is a classic. 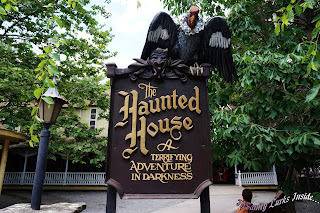 If you'd like to know more I suggest you head over to "Knoebel's Haunted House-Laff in the Dark" for a good history of the ride! Following their grand tradition of taking others parks unwanted rides and giving them new life, we headed next for 'The Black Diamond'. It was new to the park in 2011 when it re-opened after being relocated from Morey's Piers in Wildwood, NJ where it had sat unused for at least 3 seasons that we personally know of. Black Diamond is another classic darkride but one that somehow got mixed up with a bit of roller-coaster track. It's powered by gravity, so it does count as a coaster but it follows the darkride pattern of telling a story. The story? Miners, Naturally. A mine gone wrong, with folks trapped inside the spooky haunted mine. Featuring water effects, small drops and the various pop-up scares of haunted houses. Another attraction that's pure cheesy fun, it's gotten a severe upgrade from the last time it operated (or some I'm told by Kitsune who rode it at Morey's when it operated). "It's so much nicer. Everything works, it all looks new but old at the same time! So much nicer then when Morey's owned it, it was crap back then. They let it fall to pieces, nice to see it back" was pretty much the quote. The bathrooms are DISGUSTING. Seriously, utterly and totally foul. Not a single one of them either of us visited was in during our day was clean. Each and every one of them smelled like a unkempt truck-stop and looked like one too. None of them had hot water to wash your hands in, two of them didn't even have soap in the dispensers and not a drop of hand sanitizer to be seen (so make sure you carry your own). You know the phrase "I felt like I caught a disease in there"? That's about the state of the restrooms. Seriously Knoebels, You need to fix this because it's unacceptable on so many levels! Okay, back to the reporting that doesn't involve an icky topic. Since we are on the subject of coasters and on that side of the park, our next ride was the Phoenix. With a history much like Black Diamond, Phoenix was moved from Playland Park in San Antonio Texas in and opened to Knoebels in 1985. 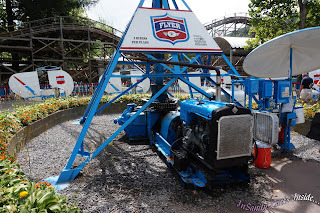 Originally built in 1948 and is a classic Philadelphia Toboggan Coaster. Phoenix pretty much embodies everything great about wooden coasters. It's got the noise, the speed and the airtime plus it's just a damn great ride. None of this modern "safety belt you in THEN drop a restraint on you" business going on. You get your single lap bar and you ride like your suppose to, you enjoy the ride as it was meant to be when built. In these days, that is damn near impossible to find. Taking a little break we wondered around a little. Spotting another classic ride we headed towards Flyer. Now, if your not familiar with this ride is probably because most parks don't bother to keep them anymore. Personally I can only think of 3 that are still operating with Knoebels being one of them. Basically your given a 'sail' that you control and your then spun around in a circle, allowing you to "fly" as high or low as wanted. These rides require some skill to operate without snapping the sail (which isn't allowed as it damages the ride) but to get a smooth movement from. So Kitsune drove and I rode, which allowed me to realize that Knoebels Flyer still has fully canvas 'sails' rather then aluminum or plastic like some others have been replaced with. With some riding accomplished we decided to have some lunch. Heading back into the middle area of the park we found a place offering steak sandwiches and some much needed non-soda/non-water refreshment at The Wharf. For another $9 or so we split a decent size sandwich and a large iced tea. Right beside the creek we got a decent lunch, plenty of shade and plenty of seating. Unlike a lot of big name parks, Knoebels doesn't hide that their employees are humans and not automation's. We found ourselves in the company of several folks having lunch, which before we even dug in told us the food at this stall had to be good. If the employees will eat there, your generally have a winner.. and it was. The tea wasn't instant and wasn't sweet enough to rot your teeth, the sandwich was good. Just a little crispy and not overly filled with grease, I think at this point we really liked the food plus all the options! After a decent amount of relaxing it was back to the very tough life of riding. Heading towards the back of the park we crossed the creek and encountered another classic coaster. Twister is a bit of an odd duck, it wasn't relocated from another park but built in 1999 from modified plans of the original Mr. Twister which once operated at Elitch Gardens in Denver, Colorado. Knobels wanted to move the original ride but didn't have the space, so they got hold of the plans and modified them to fit the space they had. Twister doesn't have a straight track to save it's life, the only 'straight' part of this ride is at the lift hills. It tosses and turns you, making so many crosses over itself it's hard to figure out where exactly you are in the ride. It's got the same epic recipe of awesome though: airtime and speed! After Twister we wandered about, criss-crossing the park a few times just browsing through the craft stands and stores. One thing I noticed, their merchandise prices aren't insanely high. You can get a nice shirt for $15 and a hoodie for around $20. Which beats out the prices at most of the other parks I've visited this season. Encountering a Whip we stopped because, how can you pass up a classic ride? Whip's are becoming more and more rare at parks as they are pushed out in favor of other rides but they still hold a special place for riders. Knoebel's has an original and it's kept up at meticulous standards plus they don't cut your ride short (like so many other parks do) giving you full time to enjoy being slung around an oval track and enjoy your physics! At this point the sun was setting and I was getting cold, we headed towards the car to drop off our purchases and to grab my sweatshirt. 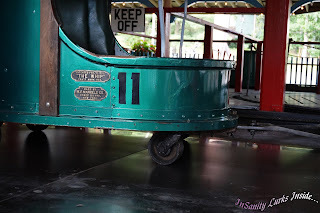 Oh the way back we snapped pictures of more of the classic rides found at Knoebels even if we didn't ride them. By this point we stumbled onto the flood sign. If you know anything about Knoebels it's the fact that every few years the creek goes into revolt and floods the park. From 1972-2011 Knoebels has had multiple damaging floods which the park always recovers from somehow. 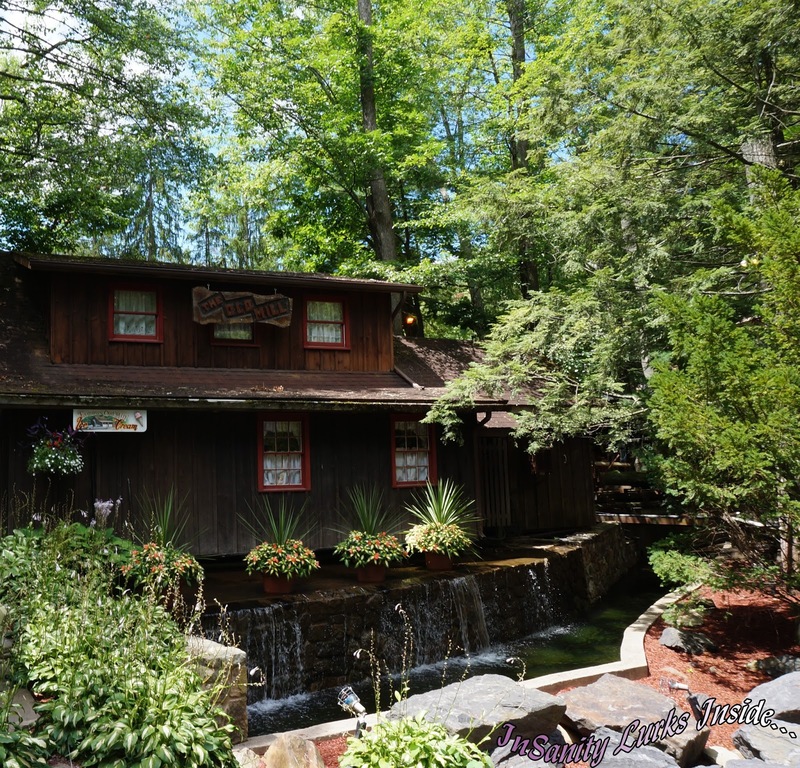 When other parks might move or just give up, Knoebels just cleans it up and re-opens for the next season. 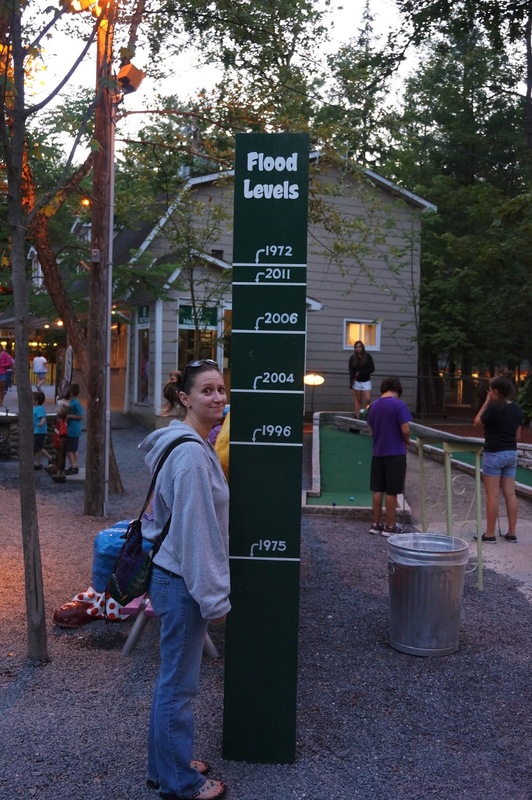 The flood sign I'm standing next to not only proves I'm short and would have drowned but just how high the water has gotten over the years with 1972 and 2011 being the worst floods the park has faced. At this point's the lights came on and it was fun time. 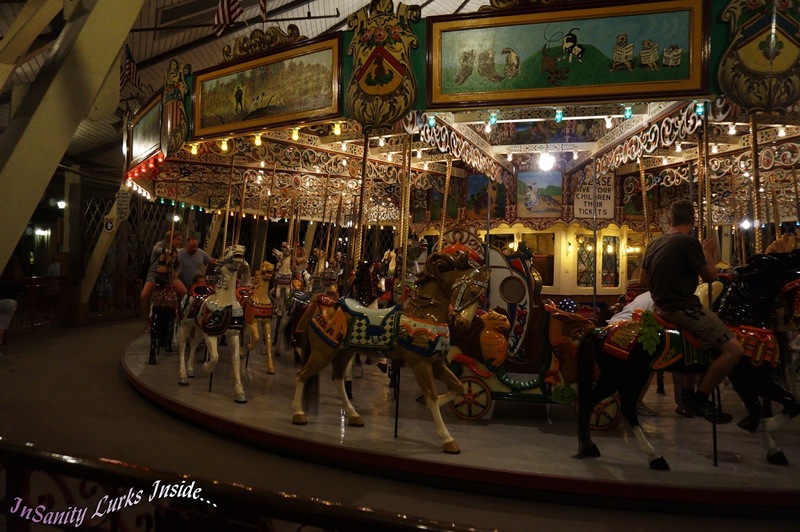 As I said in the overview Knoebels has a classic Carousel, one that still allows riders to catch the 'Brass Ring' giving you a free ride. Now I'd never seen this before until I took my first trip to Knoebels years before and needless to say, I was in love. 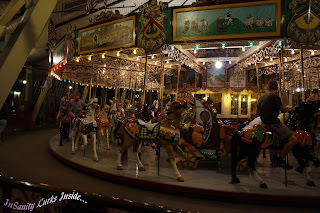 While it might not be the biggest carousel in the world nor the most elaborate, you will see people of all ages clamoring for this ride all because of the ring catching game. The outside horses don't move but as you circle around an extended 'arm' is dropped giving you the chance to pluck a ring from it. Whoever catches the brass ring wins a free ride, it only took to my second ride until I won! We easily rode the carousel five times, sucking up a decent amount of tickets as it costs $1.25 to ride (unless you have the ride band). Now, my only complaint about the carousel this trip was the fact they where putting the Brass Ring in entirely too damn early in the ride. Once the arm with the rings was down, within two revolutions it was caught which took some of the fun out of catching the rings. It was a pattern that happened each and every time we rode. I'd seriously suggest they fix that and let people feel they enjoyed their ride a little more and let the spirit of competition take place before giving away the prize in the first round. By this point in the night we circled back around, picking up multiple re-rides on both Twister and Phoenix as well as the Haunted House and Carousel. Dozen's of night pictures with the lights got taken and we generally just had fun in the dark. 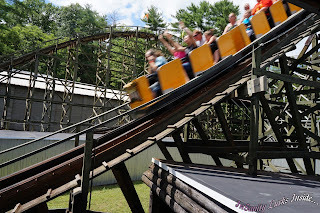 While Knoebels isn't the biggest or grandest park I've ever been too, I had to admit it's one of the more fun ones (aside from the bathroom problem). You may not think it's much to look at but the history is neck deep and the rides are classics you just don't see anymore. If you haven't experienced this park you really are missing something, you just need to spend the time and visit. It doesn't have to be for a week or even a full day but everyone should enjoy it at some point. Yes, I know that I haven't talked about Flying Turns. Because Flying Turns and all the crazy information I found out about is featured in it's own piece here on ISI. It can be found, along with new photos and rumors below! 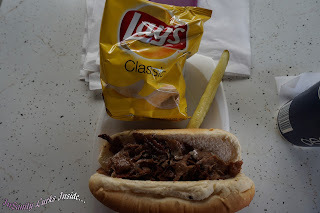 For more photos of our day at Knoebels Amusement Resort please see our Photo Report! 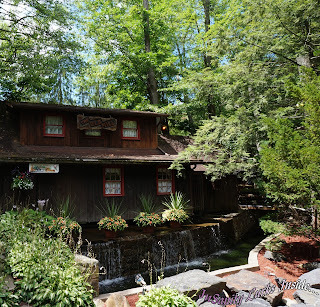 You can find it by viewing the blog or by following this handy little link "Photo Report: Knoebels". I was at Knoebels just a few days after you (Saturday, July 27) and all of the bathrooms on that day were nice and clean. I agree with everything else you wrote here, though! It's entirely possible we just had a bad day but I do try to report my experiences exactly as they are, so it had to be included. 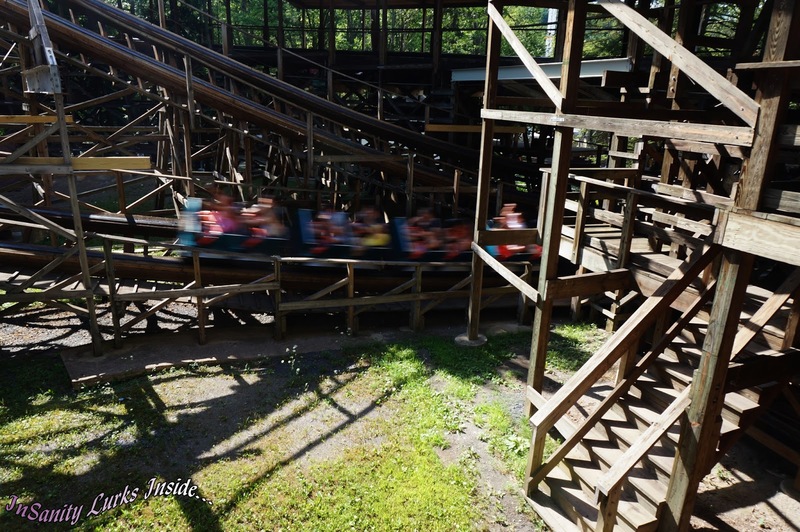 My family went to Knoebels on Aug 17. Without a doubt the best value I have ever seen in a park. My children had a blast and we spent less than $50 - Weis Markets discout is definitely the way to go. We will be back!